Any chance you can relate? While I could solve a few problems with more money, “not having enough money” most likely isn’t the main problem we have with money. Money is the kind of topic that some churches talk about all of the time, others never talk about, and a few only talk about as a last resort before going broke. There’s a good chance that many of the Christians who don’t talk about money fear they’ll accidentally sound like a church that talks about money all of the time. Money gives Christians fits because we all need it, but we all know it’s like a ticking time bomb—a really, really nice looking ticking time bomb that we all want to own. In fact, we worry that money will expose us to evil. In 1 Timothy 6:10, Paul wrote “the love of money is a root of all kinds of evil.” If we’re listening to Jesus, he makes money look pretty bad. In the Gospels, the parable of a rich man and a poor man named Lazarus provides a cautionary tale about the snare of money. The rich young man chose his wealth over Jesus, but Jesus also made the startling request to sell everything he owned. The power of money to distract us or to even take over our lives is clear. In fact, Jesus even went so far as saying that the poor are blessed. Having said all of that, it’s clear that money isn’t necessarily inherently evil. Rather, it can lead to trouble. Remember, Paul said that the “love of money” is the problem. If it’s a ticking time bomb, it’s also a time bomb that we can continually disarm. Let’s remember that Jesus was supported by a group of wealthy women. The early church in Acts pooled their resources together to support one another, yet it’s clear that plenty of Christians owned homes in order to host meetings. There’s no doubt that Priscilla and Aquila had financial means because of their trade as tentmakers. While having a lot of money can be a big problem (as in a loaded up camel passing through the eye of a needle), it’s not necessarily a roadblock to faith. Learning to be generous with money can be a tremendous source of joy. However, tons of problems arise when I start relying on money. I know that I often fear not having enough money, but should I perhaps spend more time fearing too much money? Should I worry that I’m always worried about not having enough money? I often tell myself that having a little more money would solve many of our problems and take care of most of the sources of our stress. I rarely consider how a little more of God’s kingdom could actually provide a far better resolution to my worries. There is a peace and contentment that comes from the pursuit of God (1 Tim. 6:6) and treasures that do not rust or decay. Most days, if I’m really honest, it takes a lot of faith to believe that. 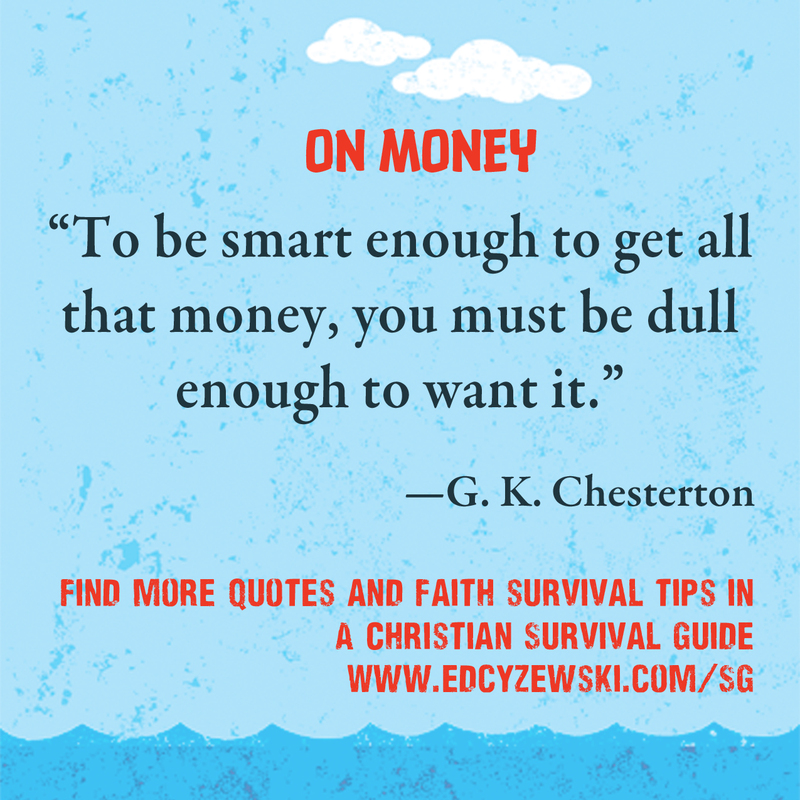 It’s no wonder that money can be such a faith wrecker. Money, in many ways, can be used to address the very same things that God wants to deal with in our hearts. I certainly need reliable financial provision, but I often want to cut God out of the equation when asking for that provision. Rather than viewing God as my provider and his kingdom as my ultimate goal, I make money into my god, trusting it to provide the security I crave. Money becomes my god that provides comfort. 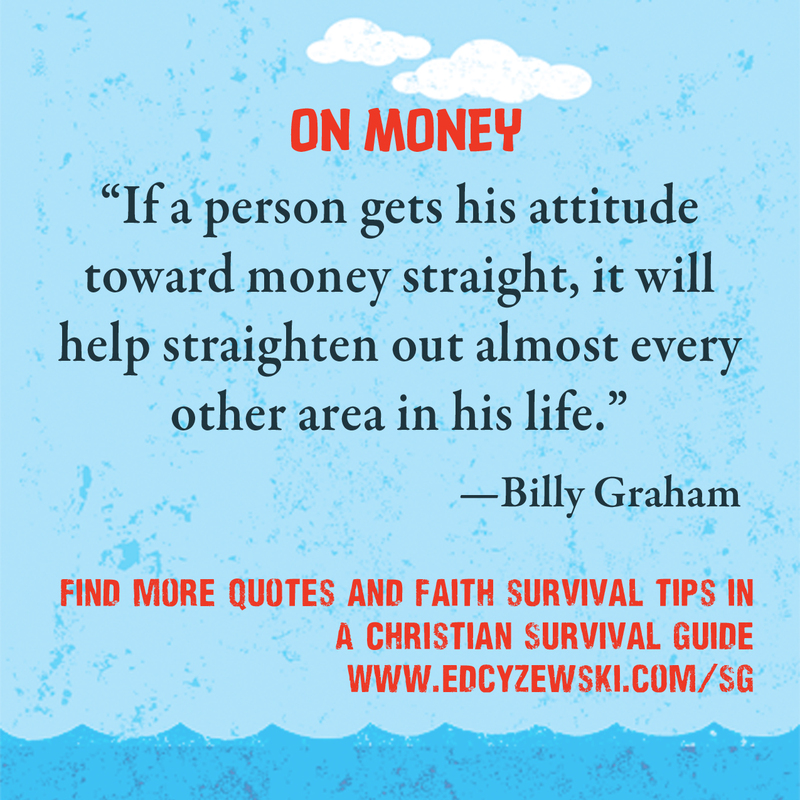 Money can wreck our faith or at least provide some really problematic distractions. While we can use it well and should never create a once-and-for-all template for how to handle money, failing to discuss it provides room for money to take over. We used to live near a very affluent town in Vermont. It was a popular vacation spot for people who made big bucks in New York City—a place where some people thought nothing of plunking down $500 or more a night for a hotel room. It was the only town where I could find a job—naturally in the tourism sector. Here’s the thing about money: it starts to change your values. It changes how you think. I was surrounded by this lifestyle. I was also extremely conscientious of how I dressed, the beat up station wagon I drove around, and how I carried myself. It’s hard to cut yourself off from the influence of money and the kind of mindset it creates. I was always thinking of new ways to spend money on our home rather than saving money or giving it to worthy causes. That felt perfectly normal, as our home didn’t quite measure up to the many homes around us. In retrospect, I can see the value in leaving that area. It would have been far healthier and helpful to be more proactive in donating most of the money that I wanted to spend on myself. How do you fight a culture obsessed with consumption? Try generosity. We consume because we think it brings happiness. However, generosity has reminded me that there’s another kind of joy that is far more long-lasting available. What have you learned about managing money? This post was adapted from A Christian Survival Guide. ← What If a Newspaper Reviewed the Book of Revelation? I’ve learned that if you do have the money you should invest it in something that will last. But I’ve also learned that you should be careful in what you spend it on. Also be careful of any hobbies. Remember that the Lord wants us to put all our heart in whatever we lay our hands on to do. If you develop more than one hobby, you will most likely never succeed in keeping up with all of them. That’s a great point about hobbies. A good hobby can be constructive. Too many hobbies or too much of a hobby can take over our lives.